The fee for tooth replacement with dental implants depends on several factors, including the number of teeth being replaced and the number of dental implants required to support your replacement teeth. Some additional procedures may be required prior to the placement of your dental implants to ensure the long-term health of your dental implants. To obtain a specific fee estimate, it is necessary to have the doctor examine your mouth. After a thorough diagnostic examination, Dr. Parvinjah will recommend the treatment that is best for you. Anyone who is missing one or more teeth due to injury, fracture, disease or tooth decay may be a candidate for dental implants. The determining factor is the amount of available bone. 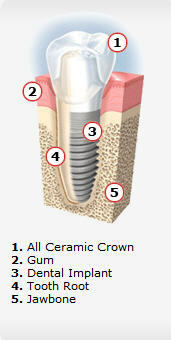 Dr. Parvinjah is the best person to evaluate whether dental implants are a viable solution for you.